Zermatt is considered by many to be Switzerland’s best ski resort and even on of the top resorts in the world. The high altitude (Europe’s highest ski area) means that skiing is almost guaranteed throughout the season and you can ski in and out of the resort. There are more than 30 mountain restaurants to keep you out all day long. The resort also has plenty of snow canons to keep the slopes covered throughout the day. The centre of the resort is mainly pedestrianized and has a number of shops to keep you busy, along with plenty of things to do for non-skiers that are there for the amazing scenery. Along with Zermatt’s offering of some of the best skiing in the world it also boasts one of the biggest inter-linked ski areas, more than 70 lifts and an underground funicular offer great coverage to the three main sections. Beginners will find some runs to enjoy but will miss out on the full experience that this resort has to offer. 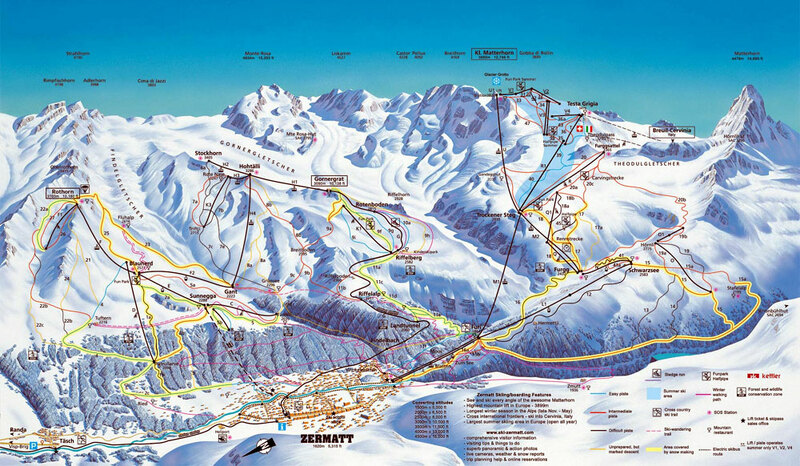 Intermediates have plenty to choose from being able to ski the whole area and even dropping into Cervinia for a visit. This is the place for advanced skiers, with so much on offer and more powder than anyone can handle. There is also the option of heli-skiing to add to the enjoyment. Snowboarders are well catered for, those wishing for more than the fantastic off-piste can visit the giant snow park, Gravity Park, where they will find enough to keep them entertained. There more than enough varied skiing to keep everyone happy. The après ski in Zermatt is as good as the skiing being both lively and varied. Restaurants are plentiful and so is the choice of cuisine, with Italy a so close it is no surprise that this option is abundant. After a day’s skiing try one of the tea rooms or traditional bars before heading out later on to listen to the live music or to head to one of the clubs. The most popular spot is probably The Hotel Post offering bars and a busy club. There is also the famous Vernissage bar and cinema, built and decorated by Zermatt’s most famous artist Heinz Julien. All in all there is more than enough for you to do to keep you up until the early hours of the morning.